With equities failing to hold the minor opening gains, and breaking lower in the early morning, the VIX spiked (intra high 14.23), but settled -4.8% @ 12.49. 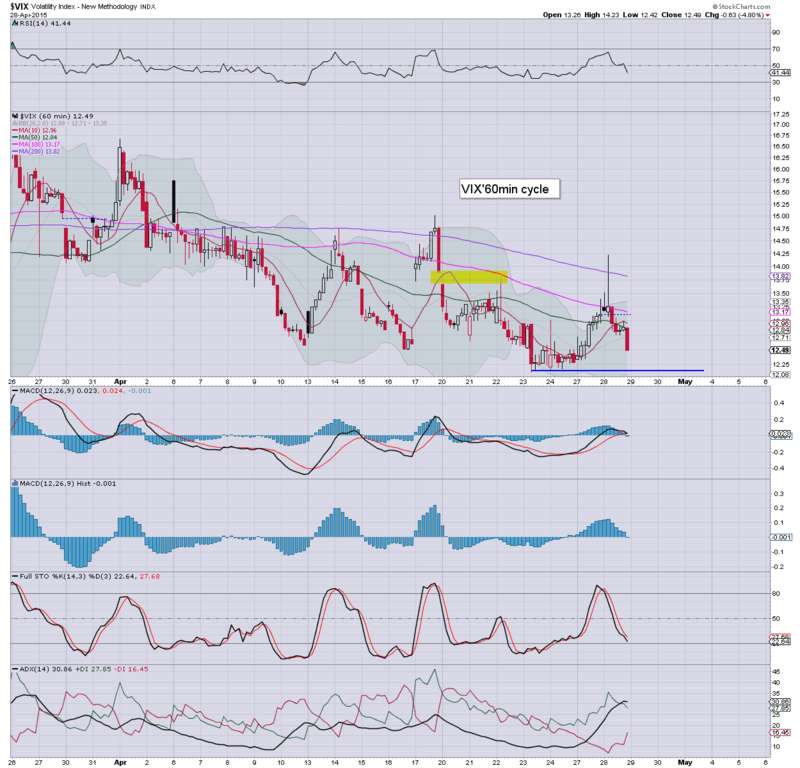 Near term outlook is for continued broad equity upside, which should keep the VIX pinned within the 14/10 zone. Even with the Dow -120pts or so in the morning, the VIX could only spike into the low 14s... briefly. 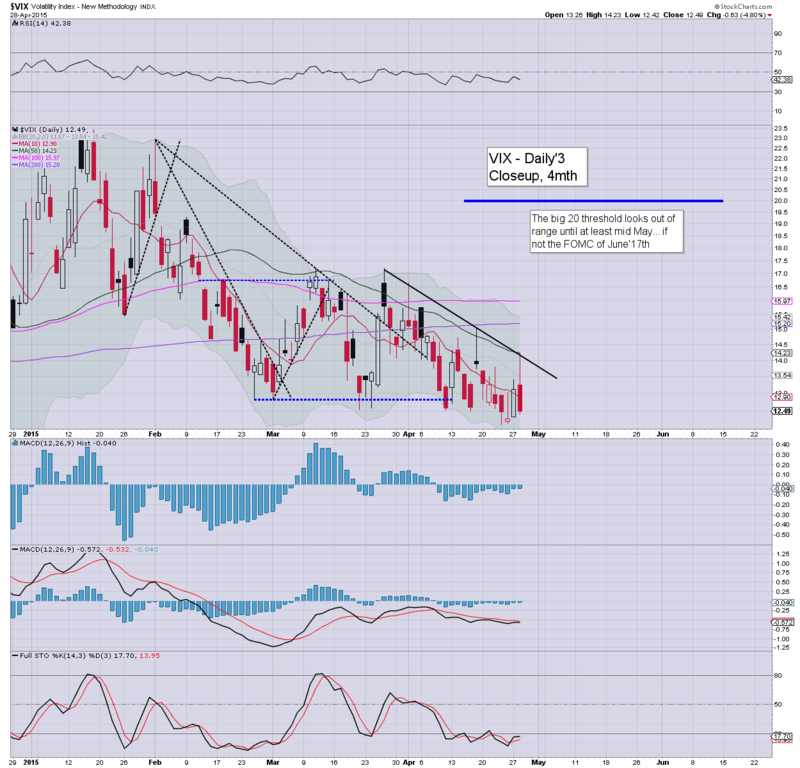 VIX looks set to remain subdued into mid May. The big 20 threshold looks out of range until at least mid June. ... interesting day... not least with the closing hour insane drama in TWTR. As for the broader market, minor opening gains.. but a swift washout in the morning.. before what was a rather typical (and expected) latter day recovery. Special closing update on TWTR... due.. with charts! So.. the re-listing price was $40.00... with an initial bounce to the $44s.. settling in the $42s. 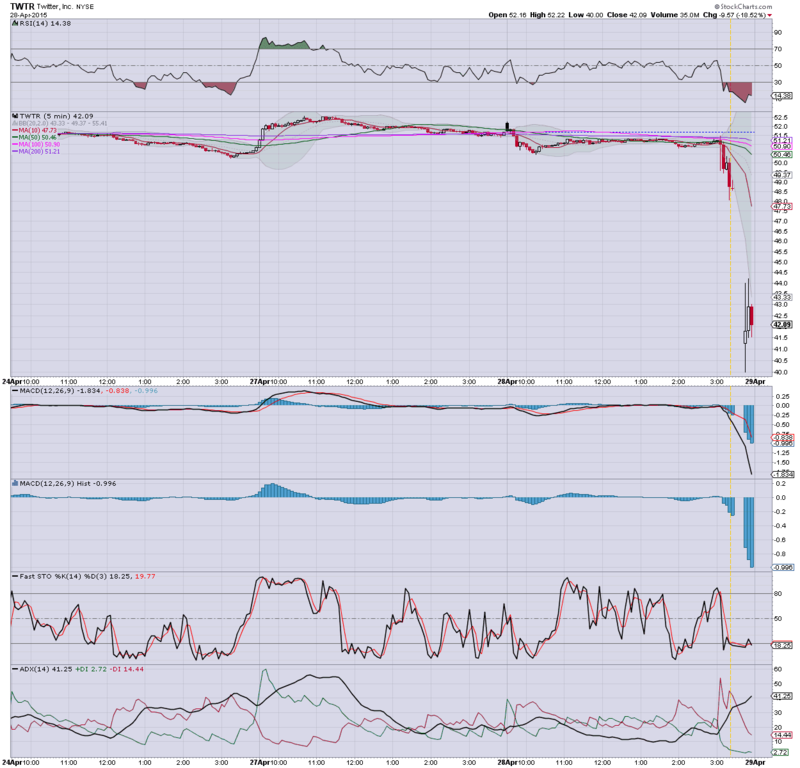 There will be high risk of an upside reversal tomorrow. What am I doing? I'm pretty glad to be a mere onlooker to this momo stock madness. I did like TWTR at $51/50 (having bailed from a long position @ $51.95 last week) and I certainly like it more in the low $40s. For now.. I ain't getting involved. As for earnings.. EPS of 7 cents... was fine... rev' was light.. and the Q2 outlook was somewhat depressed. Overall though.. I still consider TWTR infinately better than FB. 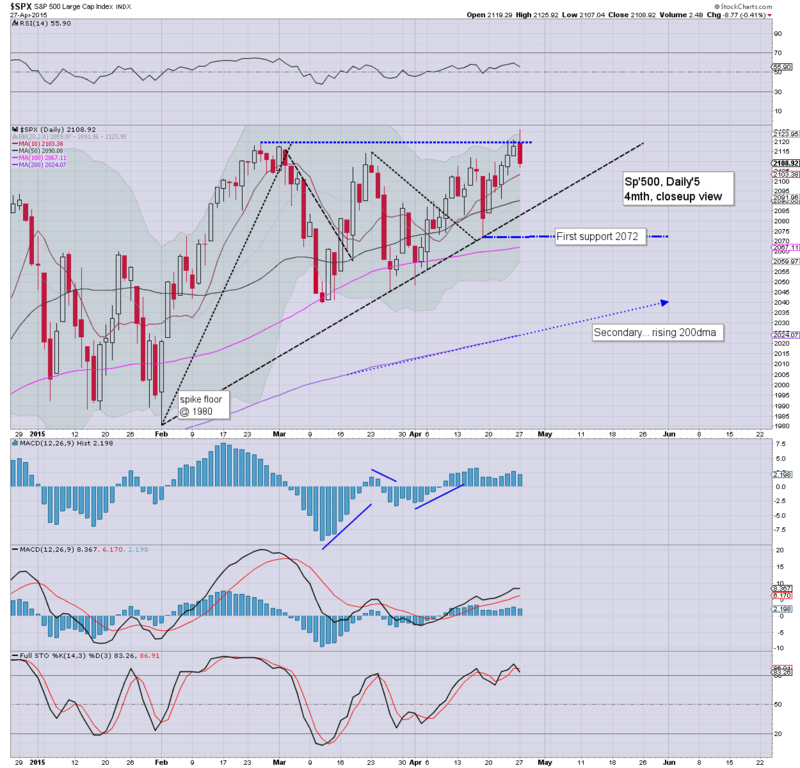 Most US equity indexes look set for minor net daily gains, with the sp'500 to settle within the 2112/18 zone. USD remains weak, -0.7% in the DXY 96.10s. Metals are holding gains, Gold +$11. Oil is battling to stay positive, +0.3% in the $57s... ahead of the latest API/EIA inventory reports. *Oil has been stuck for the better part of two weeks. If the next set of inventory reports come in no higher than 3/4 million barrels.. the likelihood is for a break to the upside.. into the low $60s. 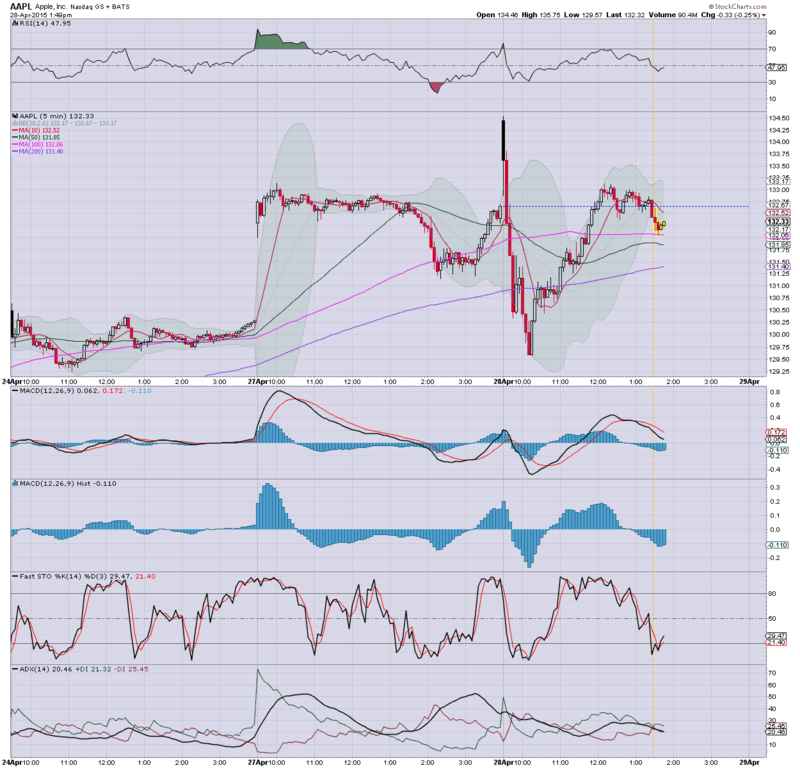 I remain long Oil - via USO, seeking an exit in the 20.50/21.50 zone. A pretty mixed day... but overall.. it sure looks like we'll close a little higher. Daily candles are offering a spike-floor in most cases.. which bodes bullish.. ahead of the GDP/FOMC tomorrow. Indeed.. tomorrow should prove to be pretty interesting. 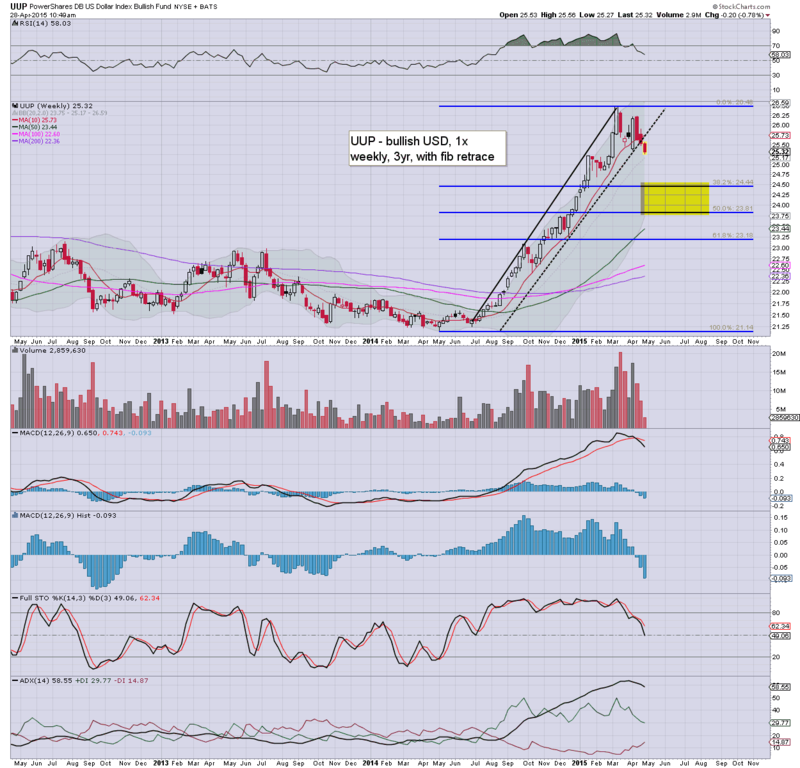 notable weakness: AAPL, -1.4%... on what is pretty large vol'. On any basis though.. renewed upside in May looks due. 3.13pm.. TWTR is seeing some crazy price action ahead of earnings. 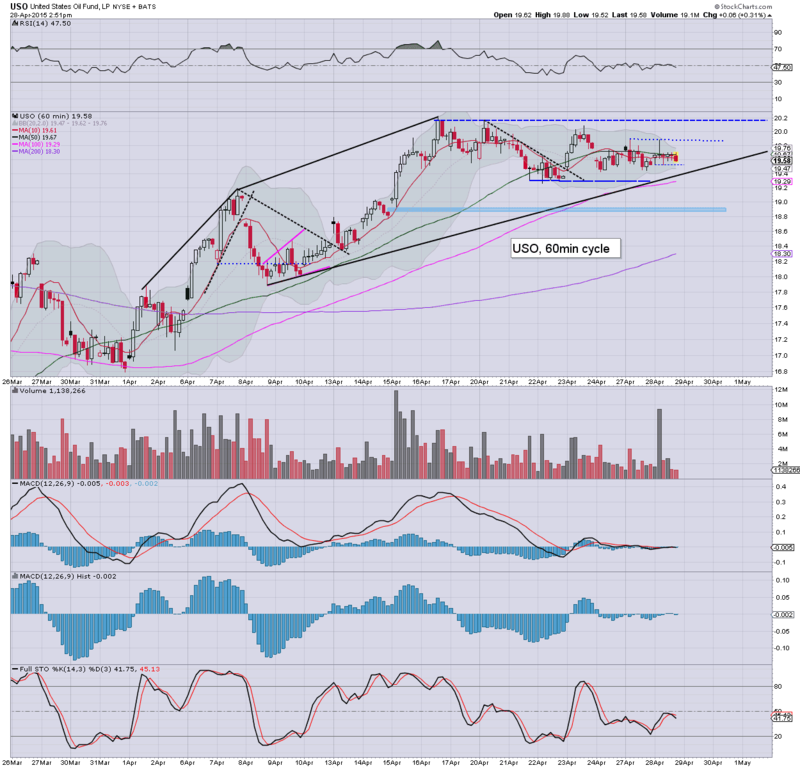 *I have no position in TWTR (having bailed last week @ $51.95). I was considering going long for earnings.. but on this occasion.. I will refrain. I'm not in the mood for any extra stress! The rumour.. rev' miss.. EPS 7 cents vs 4.... but market is not happy with it! 3.20pm.. There will be absolute hell if the TWTR reports turn out to be fake! Stock has been whacked around 4%.. losing the key $50 threshold. If the 'real results' at 4pm come in different... crazy. *...and partly.. thats why I usually avoid momo stocks.... the hysteria! 3.29pm... woah... TWTR... suspended... ahead of a news release. -5.8%.. and holding. 3.35pm... Pretty entertaining drama with TWTR... now its a case.. do they bring forward their earnings before the close? US equity indexes are holding moderate gains, with the sp'500 having seen a full 1% swing from the earlier low of 2094 to 2114. 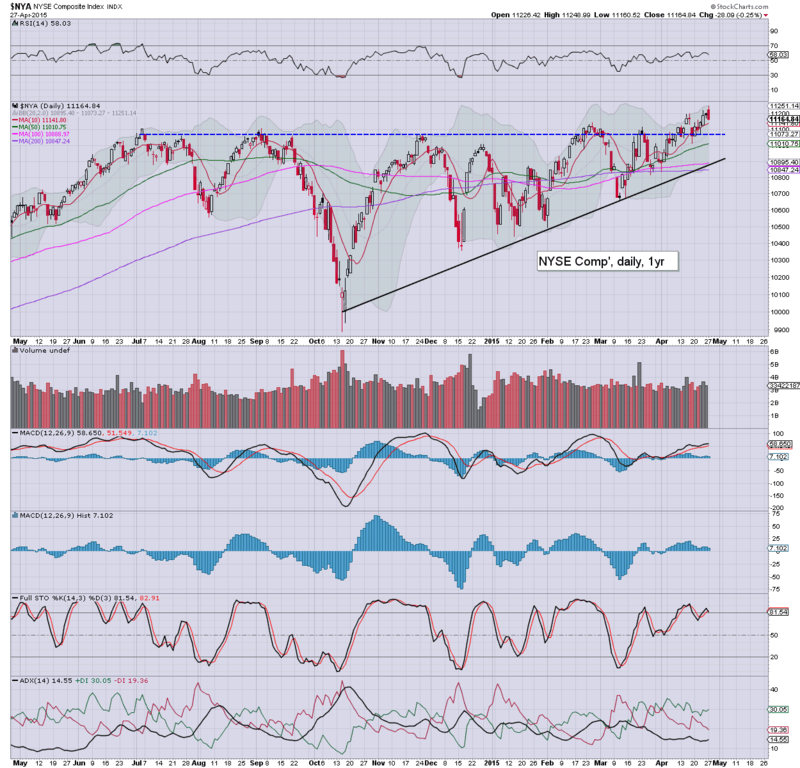 New highs look due for all indexes in the days ahead. The weaker USD is especially helping commodities, with Gold +$12, and Oil +0.8%. Another day where the equity bears are teased in the morning, only to see a latter day rally. How many times have we been through this since 2009? 600/700 times? Market will be prone to a minor down wave into the close, but still... the earlier low of sp'2094 is a pretty good spike-floor. I don't expect it to be broken under, whether on weak GDP data... nor the FOMC announcement of tomorrow afternoon. 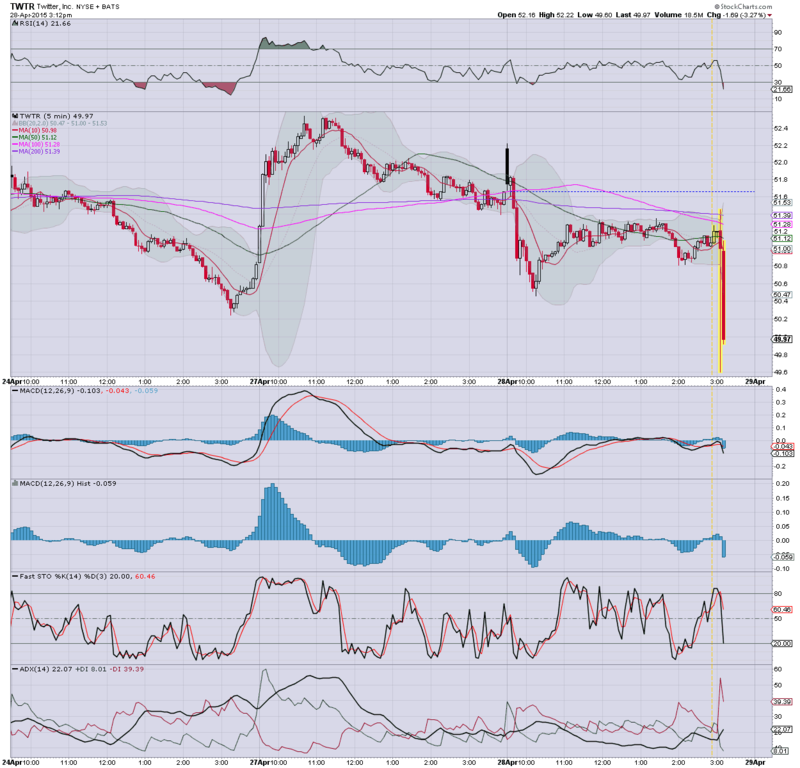 *the opening black-fail candle is a good example of why I particularly keep an eye out for them. Meanwhile... off world.. the Russians appear to have lost a Progress (unmanned) supply ship. From what I gather.. they are probably not going to be able to dock even if they do regain control, due to lack of fuel. 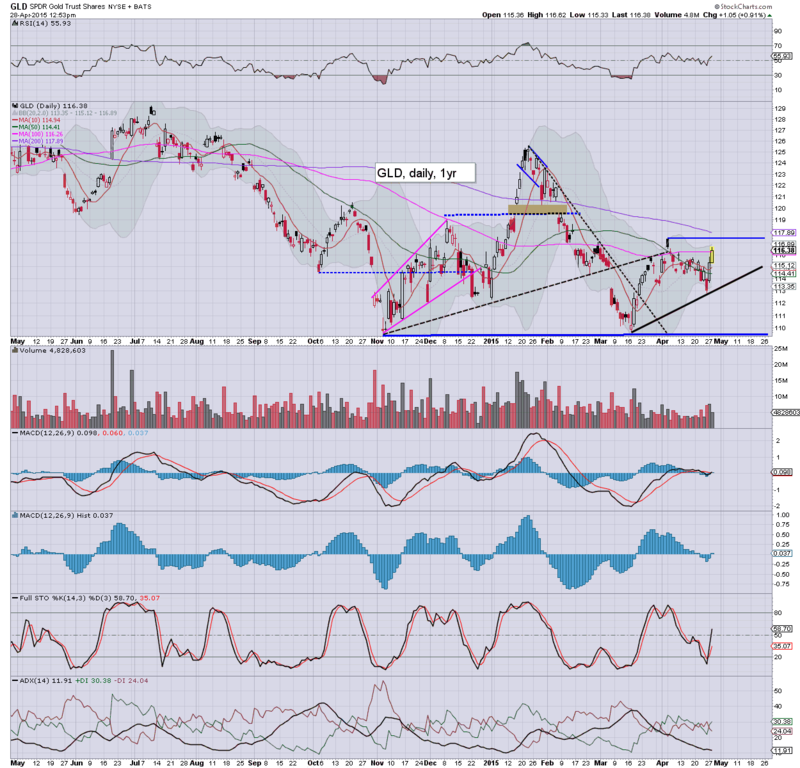 After some completely unjustified early morning weakness, Apple (AAPL) has turned positive, a daily close in the $133/36 zone now looks probable. Metals are holding gains, Gold +$10, with Silver +1.4%. Oil is battling to hold moderate gains of 0.5%. 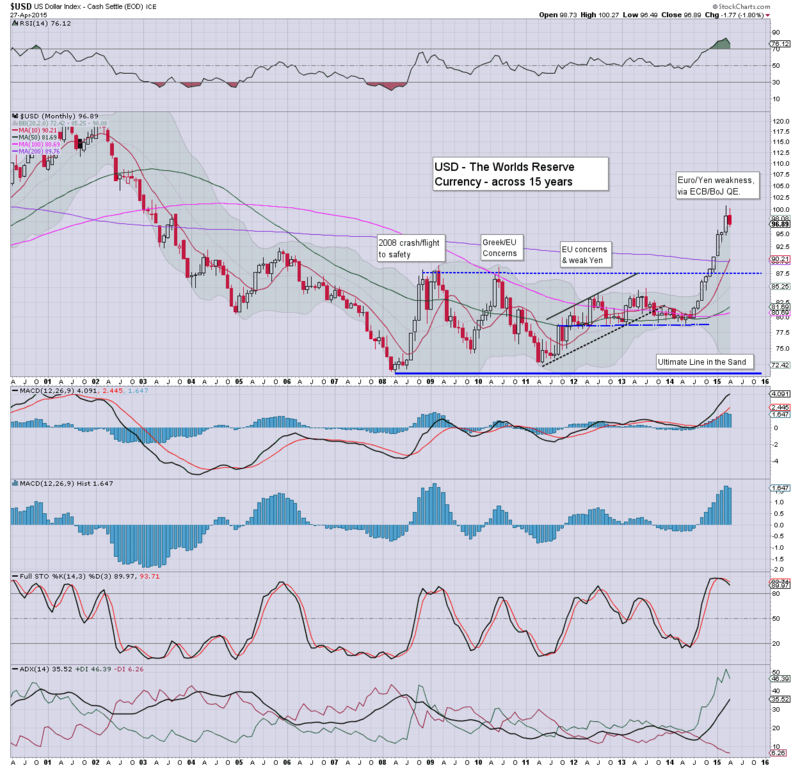 *metals are approaching rather important resistance levels. If the upside continues, the bearish H/S formation will be negated, and instead, offer upside across May.. and probably into June. Little to add... as King O' continues to drone on about Baltimore.. and other issues. 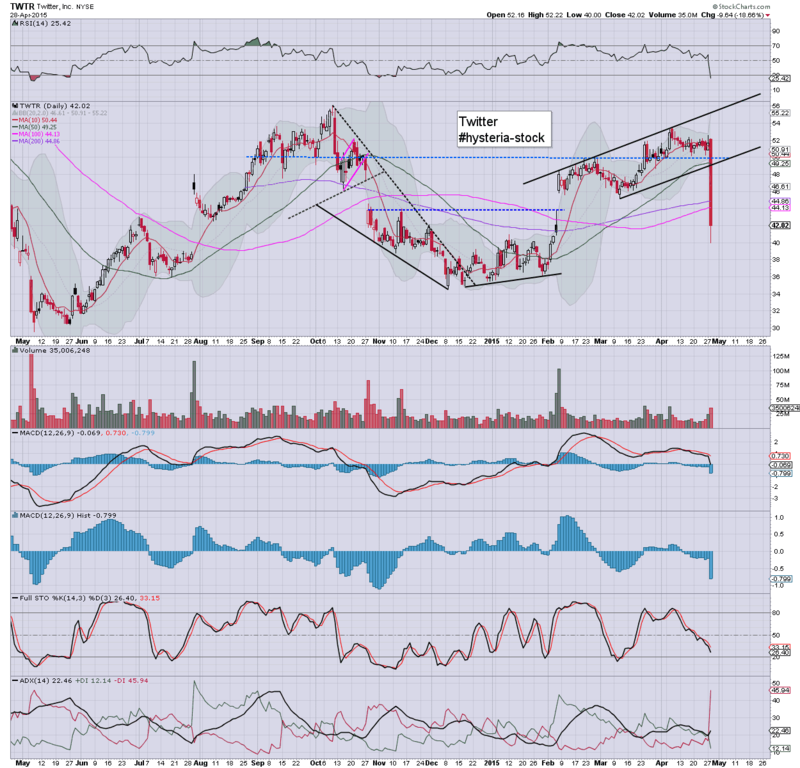 notable weakness: Discovery (DISCA) -1.2% @ $31.80s... remaining stuck... and vulnerable to losing the $30 threshold. Equity indexes have already started to turn positive, with spike-floor candles for most indexes, having swung from sp'2094 to 2113. The weaker USD is going to continue to help equities across May.. if not also June. Metals are holding gains, Gold +$11. Oil is battling to stay positive, +0.3%. *R2K is a bit of a mixed picture.. having broken the rising trend from October.. but the daily candle is now a pretty bullish spike-floor. Overall... the morning down wave (part of the blame is currently the Gulf ship story) appears nothing less than just a tease to the bears. New highs look due.. esp' in tech... which still looks set to take out the 5132 bubble high. From there.. things become clearer. Whilst equities have seen some moderate morning declines, there has been notable weakness in the USD, -0.6% in the DXY 96.20s. The break of trend should now be apparent to everyone, and it has important implications for both equities and commodities into the early summer. *there was a spurious story of the Iranians seizing a US ship.. but that seems to be completely false. Oil has cooled a little from a brief spike high in the upper $57s. The big $60 threshold remains due... with the API/EIA reports due late today/early tomorrow. A rather stark bearish engulfing candle on the daily chart. It will be difficult to see that flip to a bullish one.. by the close of today. Maybe AAPL should have posted a net loss like AMZN, or just a 50% miss like NFLX? This remains a TWISTED and sick market where things can be deeply mis-priced.. both to the up.. and downside. 11.27am... Rather significant spike-floor candles on the two market leaders.. Trans/R2K.. both are suggestive this wave from sp'2125 to 2094 was just another minor washout. A net daily gain now looks probable. If AAPL can turn positive.. that'll really solidfy the turn. So, opening chop... and as usual, it remains a case of no sig' downside power. This market is still broadly climbing. Ironically, the fact the mainstream don't even get it, makes things even more bullish. The same situation is the case in the perception for China.. and most of the EU markets. Whilst AMZN is the most mis-priced stock on the upside... one of the most under-valued (relative to main market) is AAPL. Despite excellent results, the stock have lost early gains, and is now on the slide... on heavy volume. First support is the $128/27s.. where the 50dma is lurking. 10.02am... Consumer confidence.. 95 vs 103 previous.... pretty disappointing. .. but hey... bad news is now good news... right? After all, all that matters to the market is for no rate hikes this summer. 10.07am... A rather huge bearish engulfing candle for AAPL, after breaking a new historic high of $135.75 at the open. I realise some of the bears will be getting excited about such an opening reversal... but really... would you seriously want to short such a company? To me.. it is nothing less than the height of crazy. 10.12am... R2K has broken the rising trend that stretches back to October. -0.6%.. and looking vulnerable right now. Well, now its a case of 'floor at 11am... and see what the bulls can do into the early afternoon'. 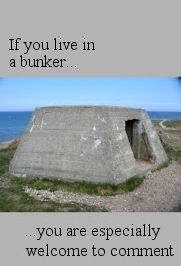 10.33am.. Buyers starting to appear... back above sp'2100, VIX already starting to cool... losing the 14s. Good morning. Futures are a touch lower, sp -1pt, we're set to open at 2107. The USD remains notably weak, -0.3% @ DXY 96.45. Metals are u/c. Oil is moderately higher, +0.5%. A new historic high in the sp'500 looks unlikely today, but still.... even a week or two of moderate weakness won't be enough to break primary support... now at the giant 2K threshold. *TWTR have earnings at the close of today, I'll have eyes on that, although am not currently involved in it. 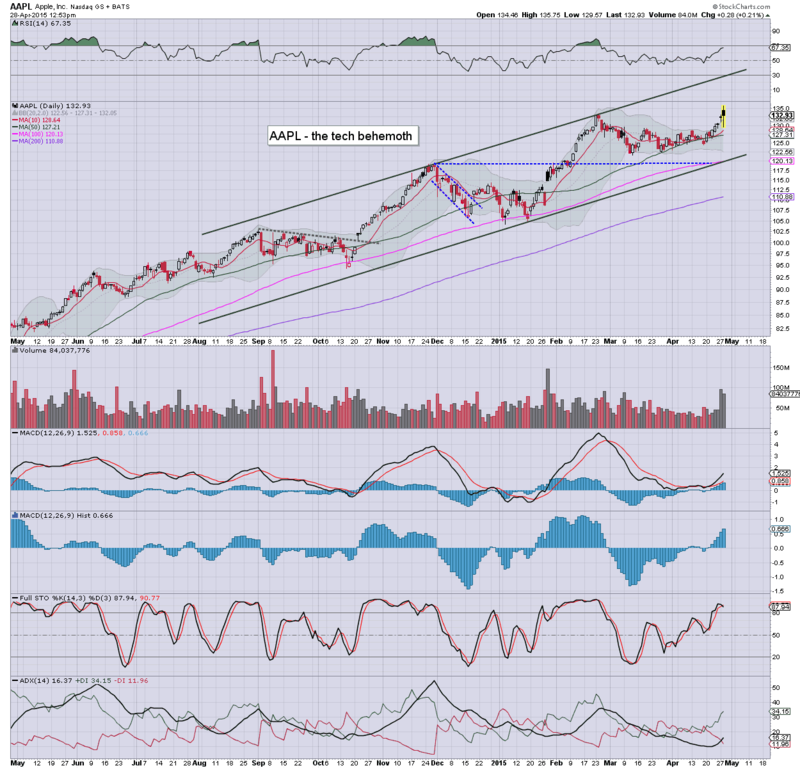 notable early strength: AAPL +1.2% @ $134, post earnings. As expected, the USD is continuing to cool, settling the day -0.2% @ DXY 96.89. There is a clear break of the broad upward trend from last May... first downside target are the 93/92s. After a retrace into the summer, the USD looks set to resume higher.. to the 120s. *the giant monthly cycle is offering the first net monthly decline since May 2014. 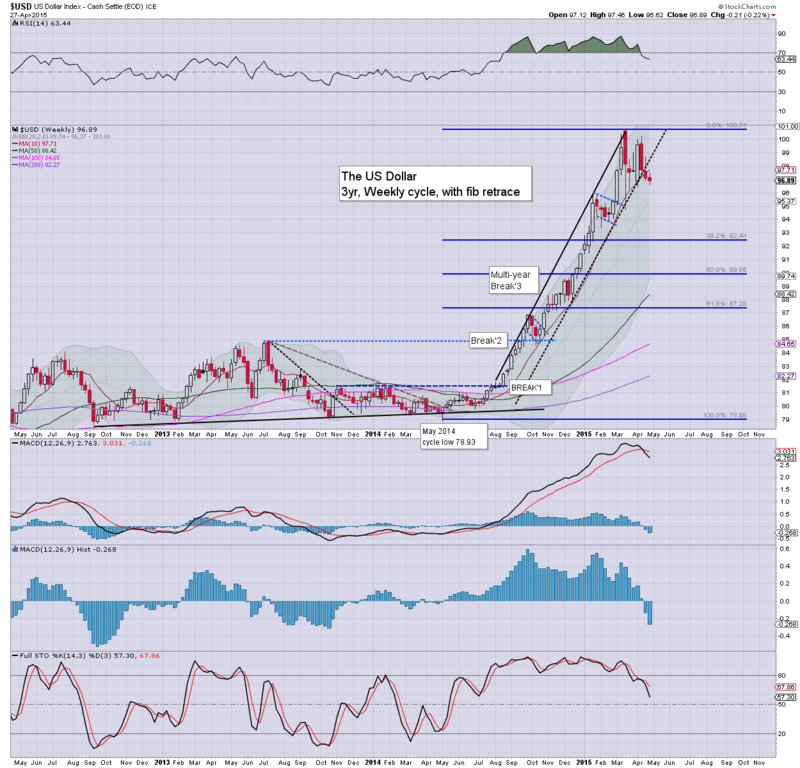 USD is cooling... and a retrace into the summer is now well underway. 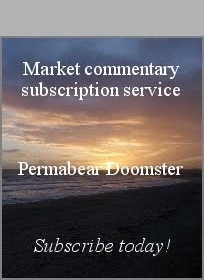 That has broadly bullish implications for equities and most commodities. Tuesday will see the FOMC meeting begin, along with Case Shiller, Consumer con', and Richmond Fed'. 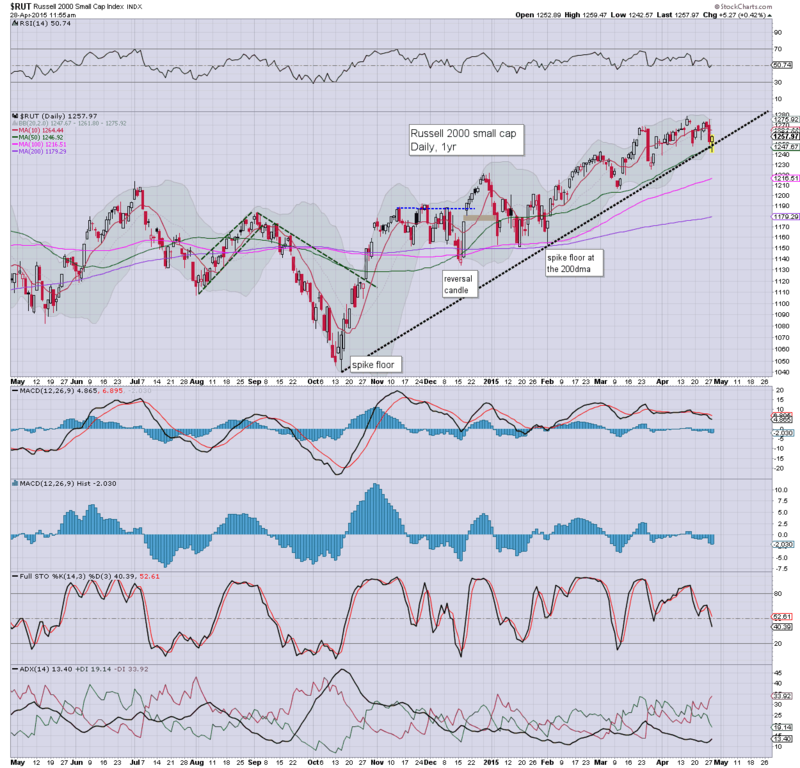 US equities closed somewhat weak, sp -8pts @ 2108 (new historic high 2125). The two leaders - Trans/R2K, settled lower by -0.8% and -1.2% respectively. 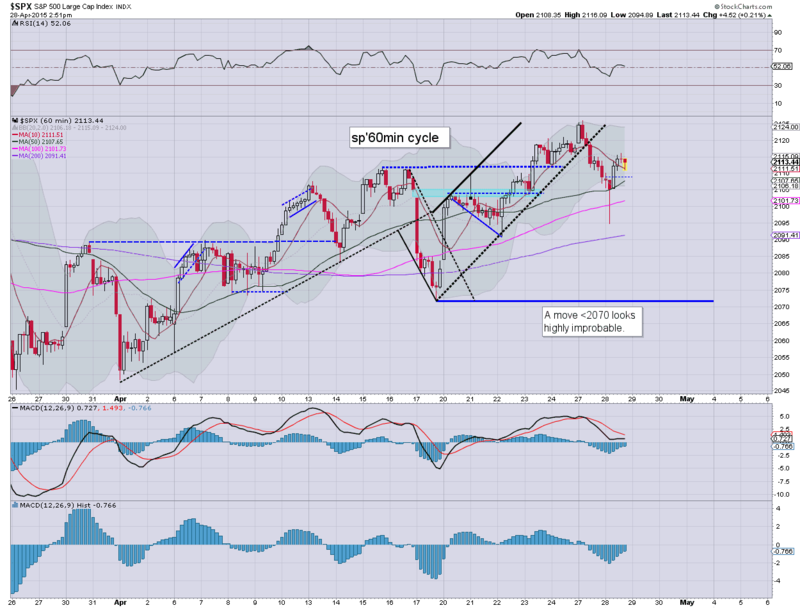 Outlook is for continued broad upside into May.. if not across the summer... helped by a retracing USD. The broader upward trend is unquestionably still continuing.